Let’s face it, it’s not always grilling season in Northeastern Michigan. Unless of course, you are one of those grill-masters that does not let a little snow and ice stop you from your home-grilled burgers! For the rest of us, we need a burger fix to get us through the last of these winter months…a taste of Alpena summer yet to come! We’ve compiled a list of 10 famous, or soon-to-be-famous, burgers from local restaurants offering the best quality beef made with the freshest ingredients around. These features will be sure to satisfy your summertime sadness burger cravings…but you don’t have to take our word for it. Try it yourself! The Black Sheep– featuring the “Black Knight Burger”. This one-of-a-kind, authentic English burger is made with 1/3 lb. ground chuck patty char-grilled to just the way you like it. Topped off with Swiss cheese, a fried egg, French fries, lettuce, tomato, onion, and 1,000 island dressing with a side of more fries! The disclaimer on this menu item cautions, “not for the faint of heart”. Austin Brothers Beer Company– presenting the “Grecian Burger” off their pub fare section, this burger is made from lamb cooked to your perfection. Topped with tzatziki, red onion, feta, and tomato on a house-made challah bun. Served with a house pickle and beer-battered fries. Don’t forget to pair it with Austin Brothers signature Woody Wheat on tap! The Fresh Palate– Choose your protein at the Fresh Palate! Your choice of either grass-fed beef or chicken burger, or try out veggie burgers of garden pinto, black bean Portobello, or Mediterranean cannellini. For a unique twist, try the “Flarebanks”. This combination comes with pineapple mango slaw, tomato, avocado, pepper jack, and orange-ginger sauce. Do you have what it takes? 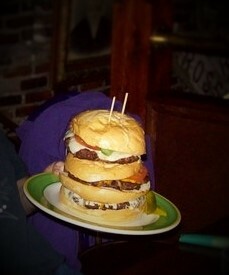 The “Three of a Kind” burger at John A. Lau awaits for your bravery! JJ’s Steak & Pizza House– featuring a twist on a classic with the “Western Burger”. This juicy burger is made just the way you like it topped with cheddar cheese, onion rings, jalapenos, and drizzled with BBQ sauce. With an option to add Applewood bacon, this burger does not get any more American! All burgers are served with a side of chips or an option for fries. The Sandbar & Grill– it’s always summer at The Sandbar & Grill, and for a taste of the fiery south of N’awlins, we give you the “Blackened Cajun Burger”. This burger is made from 1/3 lb. of beef fresh from Perch’s IGA of Alpena and is complete with a special southern seasoning, hot sauce, and Creole mustard. Served with fries and an option for a pretzel bun, this all-American dish is said to “get your motor going”! Court Yard Restaurant– get traditional with the “Half Pound Cheeseburger”. Two quarter-pound beef patties served with your choice of cheese, lettuce, tomato, and onion. Try adding their garlic mayonnaise for a twist! All burgers are served on an artisan roll with your choice of steak fries, beer fries, or sweet potato fries. Twin Acres 19th Hole– offering their now famous “19th Holer” made with a half-pound of burger and includes cheese, tomato, and onion, and topped off with Marie’s Homemade sauce. What’s Marie’s Homemade sauce? We encourage you to find out! All burgers at the 19th Hole are served with chips and a pickle with an option to substitute for steak fries. CW’s Restaurant– turn up the heat with CW’s “Jalapeno Chipotle Burger”, flavored with jalapenos, Swiss cheese, and a smoky chipotle sauce. Pair with your favorite brew from a wide selection at adjoining Sneakers Bar & Grill. The Owl’s Nest– try out one of The Owl’s signature burgers, such as the “Shipwreck”. One signature steak burger dripping with creamy Bechamel cheese sauce over house-made pastrami, piled high with an onion ring, a farm fresh egg, and drizzled with house-made barbecue sauce. Yum! Where’s the beef? Show us your burger, (because after reading this, we know that is what’s on the menu for tonight), on Instagram or on our Facebook page! Hashtag it #AlpenasBurgerBucketList along with which place you are at. Whichever place you choose, we can all agree that there is a burger, or non-burger, for everyone’s likes here in our Sanctuary of the Great Lakes.